Model electron spin maps of the iron-tellurium-sulfur material. The left-hand column, a-c, shows three models of electron spin correlations, with the red and green colors of the peaks and corresponding planar projections below each model representing oppositely oriented spins. The images on the right, d-f, show the resulting neutron scattering patterns for each case. Starting at a, which represents the dominant correlations at high temperature, notice how the spins form alternating squares like a checkerboard in the planar projection, and how the "square dance partners" of the pattern change to diagonals in (b), which occurs on cooling to low temperature, and finally to alternating stripes stipulated to exist in a good superconductor (c). Despite a quarter-century of research since the discovery of the first high-temperature superconductors, scientists still don't have a clear picture of how these materials are able to conduct electricity with no energy loss. Studies to date have focused on finding long-range electronic and magnetic order in the materials, such as patterns of electron spins, based on the belief that this order underlies superconductivity. But a new study published online the week of August 3, 2015, in the Proceedings of the National Academy of Sciences is challenging this notion. The study, conducted by researchers from the U.S. Department of Energy's (DOE) Brookhaven National Laboratory and Oak Ridge National Laboratory (ORNL), describes how an iron-telluride material related to a family of high-temperature superconductors develops superconductivity with no long-range electronic or magnetic order when "doped" with a small amount of sulfur. In fact, the material displays a liquid-like magnetic state consisting of two coexisting and competing disordered magnetic phases, which appears to precede—and may be linked to—its superconducting behavior. "Our results challenge a number of widely accepted paradigms into how unconventional superconductors work," said the study's lead researcher, Brookhaven physicist Igor Zaliznyak. "I believe that we have uncovered an important clue to the nature of magnetism and its connections to superconductivity in the iron-based superconductors." This advance could open up a new avenue for exploring the emergence of a property with great potential for widespread use. Conventional superconductors, which must be chilled to extremely low temperatures to operate, already play a key role in many modern technologies, from medical magnetic resonance imaging (MRI) to maglev trains. New clues about the function of unconventional superconductors, which do not need to be super-cooled, could lead to many more technologies, including, potentially, zero-energy-loss power transmission lines and other important energy applications. Indeed, other materials based upon a similar structure as the material studied here can operate as superconductors at these "warmer" temperatures, so understanding the physics of this close relative has many important implications. Zaliznyak and his collaborators studied the unconventional superconducting material, made of iron and tellurium (FeTe), using neutron scattering at ORNL's High Flux Isotope Reactor, a DOE Office of Science User Facility. They created maps of magnetic scattering for the material for several temperatures and as the material was doped with a small amount of sulfur. Like a composite photograph made of several separate photos, the maps stitch together many "snapshots" of the magnetic order in the material. They found that the ordering was extremely local in nature, existing for only an instant before changing—a characteristic of a liquid-like behavior. 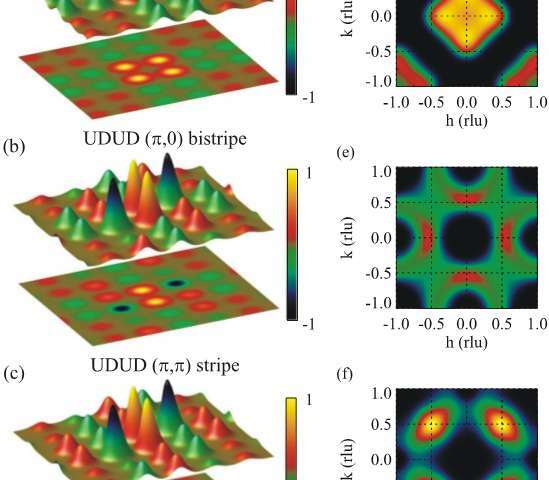 In fact, the results revealed that a fundamental change in the local, liquid-like pattern of electronic spin correlations was the key change that accompanied the emergence of superconductivity with decreasing temperature in this material. "The measurements reveal dynamical arrangements of magnetic moments similar to the patterns formed by square dancers on a dance floor," said Zaliznyak. "As the temperature was reduced, the magnetic atoms appeared to change their partners; in this case, the dance move was initiated by the mobile electrons that eventually develop into the superconducting state." In addition to offering insight into a potential mechanism for the emergence of high-temperature superconductivity, this work also provides valuable insight into the nature of liquids. Despite being among the most common condensed matter systems—we are surrounded by and largely made of water—liquids are still poorly understood at the microscopic level. In fact, the dynamic and fleeting nature of the local order in liquids is what makes them particularly difficult to study. The idea that liquids can be a mixture of two distinct liquid "species" that have different local structures and densities dates back to the late nineteenth century. Even now, the possible existence of different liquid "polymorphs" in simple molecular fluids, and liquid-liquid phase transitions between them, continues to receive considerable attention in the research world. But the issue has not been settled, mainly because the competition between different liquid phases only arises at very low temperatures, often far below freezing. "In some materials, however, such competition arises quite naturally in systems of electronic magnetic moments, where the development of magnetic order is hindered by competing interactions," said Zaliznyak. "In these cases, the material remains disordered even at temperatures much lower than the energy of magnetic interactions, thus producing an electronic spin liquid state." "Our results studying the spin system of sulfur-doped FeTe provide a rare experimental example of such a liquid polymorphism." The group's results also refute another set of widely accepted views of the electronic states in metals, where electrons are only allowed to occupy a certain set of rigid energy bands. The spin-liquid state they discovered seems to reflect the existence of new electron-orbital hybrids, likely resulting from the sulfur doping but also brought on by changes in temperature. "This is a surprising discovery that calls for a profound revision of the 'tight binding' model of electron orbitals," said Zaliznyak. He and his group also may have found an explanation for mysterious neutron scattering patterns observed by other groups studying iron-based superconductor samples. "It appears that all of the variety in the neutron patterns that have been observed in these materials can be well described by our spin-liquid model," he said. "They all manifest with very similar local correlations, revealing that we may have found an amazing intrinsic universality among them." Zaliznyak conceived the experiments and performed the neutron scattering measurements with ORNL's Andrei Savici and ORNL instrumentation scientist Mark Lumsden on materials synthesized by Rongwei Hu and Cedomir Petrovic in Brookhaven's Condensed Matter Physics and Materials Science Department. Brookhaven Lab theoretical physicist Alexei Tsvelik provided theoretical support and guidance throughout the project. "Theoretical validation of new ideas was absolutely essential to our success," Zaliznyak said. There is no classical mechanical theory of superconductivity or magnetism. The closest we can get to understanding what magnetism is, that it is a property of moving charge while definition of charge is vague enough at best called a type of property of matter. But theory of magnetism is all in the class of field theories where term field is vague i.e. something from which a force can be derived from with peculiar assumption of continuity matter in time and space in direct contradiction of classical mechanical world view. Of course quantum mechanical theory, a field theory in itself rejected this classical notion of existence of the matter and hence become unintelligible. We need new intelligible superconductivity theory to deal with high temperature superconductors otherwise we will only be guessing.